ASIC with Ankit: The two Door Keepers: An Assertion, to make sure bad thing does not happen and coverage, to make sure Good thing happens! The two Door Keepers: An Assertion, to make sure bad thing does not happen and coverage, to make sure Good thing happens! 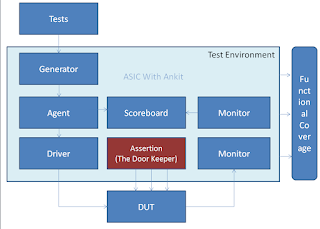 As we all know SVA (System Verilog Assertions) and SV Coverage are playing major role in test bench implementation which helps us achieving maximum confidence on bug free design. 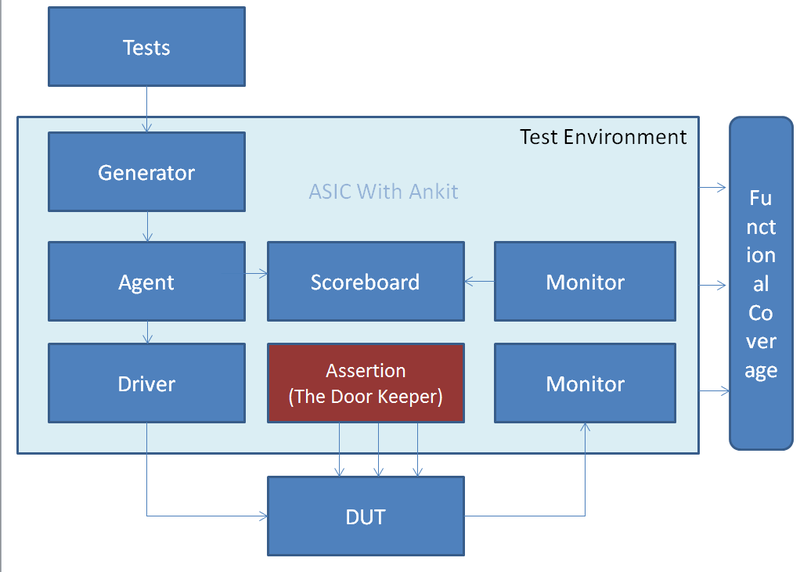 These components in the test environments are working as a ‘Door Keepers’! Assertions are mainly doing job to make sure bad things does not happen and Coverage is mainly doing job to make sure Good thing happens!! Functional Coverage are connected with different entities in the test bench to captures the information from the various places of test bench. Coverage gives us an enough confidence to make sure Good thing happens during the simulation. Functionality of functional coverage is to make sure that functional items, scenarios or stimulus are generated and covered. Functional coverage gives us confidence more on test bench whether all the identified, defined coverage items are generated and covered or not! At some extend functional coverage also makes sure that nothing bad has generated during the simulation. To catch such kind of unexpected behavior we have illegal and ignore bins!! As we know simulation tools are intelligent enough to catch expected and unexpected behavior and dump that in to .ucdb (coverage) files. Assertions and Coverage are doing such a great job in test simulation and making sure nothing bad happens and also makes sure Good simulations happens! These Door Keepers are giving heads up at the end of the simulation if something went wrong during the simulation. As a conclusion, we should not see assertion message at the end of the simulation message and should see lots of coverage information in successful simulation! We, the engineers have to always make sure that ‘Door Keepers’ are intelligent and efficient!! Gorgeous examples. Well done! Please do keep us up to date. Thanks for reading and appreciate, Let's stay connected.